Copper-coated horseshoe nails resulted in less microbial damage to the surrounding hoof tissue than their conventional steel counterparts in an Australian study. Farriers Dr Brian Hampson and John Wilson, writing in the Journal of Equine Veterinary Science, said the use of copper-coated steel nails was becoming more common during shoeing due to their supposed ability to reduce bacterial invasion, despite limited evidence of their effectiveness. Copper, they noted, had been used as an antibacterial agent for centuries and recently gained mainstream support in medicine as a first line of defence against multi-resistant bacteria. Copper ions have been shown to destroy bacterial cell walls and penetrate into the microbes, causing degeneration and death. The pair described an experiment in which 11 active sport horses were shod by the same farrier for two six-week shoeing cycles using copper-coated steel nails in the left front foot and conventional steel nails in the right front foot. To eliminate bias related to the use of the same foot in all animals, a second phase was carried following a 12-week lay-off in which six of the horses were re-shod for two further shoeing cycles using a cross-over design. In this phase, the copper-coated nails were used in the right foot and steel nails in the left. An example of good nail-hole structure, with few signs of bacterial damage. At the completion of each phase the shoes were removed and the feet trimmed for re-shoeing. Before re-shoeing, a photograph was taken of the sole of each foot for nail-hole health to be assessed against a 10-point pathology scale, which scored areas of visible discolouration and decay. Overall, the hoof tissue around the copper-coated nails was found to be significantly healthier than that around the conventional steel nails in both phases of the experiment. “It appears that the well-known antimicrobial effects of copper may apply to the application of copper coating of horseshoe nails in reducing the microbial damage to the horse’s hoof frequently associated with horseshoe nail insertion,” they reported. Their study is the first to present evidence that copper-coated horseshoe nails helps to prevent hoof wall decay associated with nailing on shoes. Hampson and Wilson suggest further studies are warranted to directly assess pathogenic contamination and bacterial migration into the hoof wall associated with the use of both steel, and copper-coated, horseshoe nails. They noted that copper-containing steel does not have antibacterial properties if the copper exists in the steel as a solid solution, since copper ions are inactive and find it difficult to penetrate through the steel substrate to exert their anti-bacterial effect. As such, the technical aspects of combining copper with steel during the construction of the copper-coated horseshoe nails were crucial to the ability of the material to exert its antibacterial properties. They said caution should be exercised when applying copper-coated horseshoe nails in the presence of other horse-shoeing materials. Practical evidence from farriers indicated that copper may react adversely with aluminium shoes, sparking hoof wall damage. 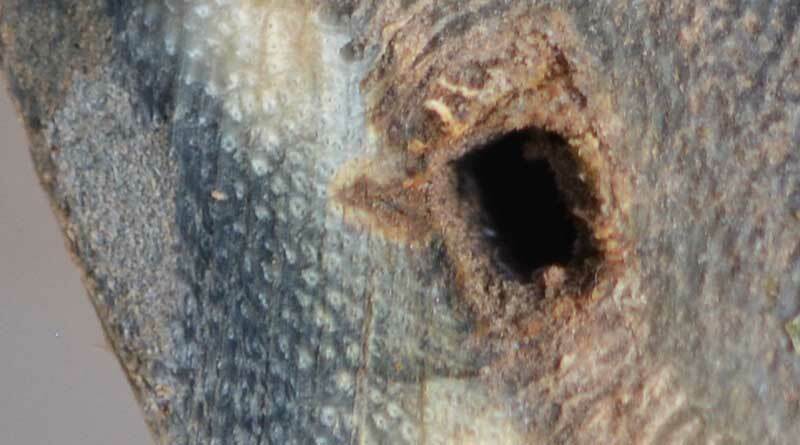 An example of poor nail-hole structure and obvious bacterial damage to surrounding tissue. They continued: “On the strength of the data presented in the current study, farriers may utilise the antibacterial effects of copper-coated horseshoe nails with confidence when applying steel shoes to horses’ hooves susceptible to bacterial invasion. They stressed that the soundness of the hoof wall ultimately depends on many factors such as correct trimming, correct shaping and fitting of horse shoes and overall horse health. Hampson is with Sunshine Coast Podiatry Services in Valdora, Queensland. He completed a PhD in 2011, specialising in the feet of wild horses. He works part-time as a farrier and continues to conduct hoof research. He has had 18 peer-reviewed papers published. Wilson is with John Wilson Farriery Service, in Doonan, Queensland. He learnt to be a farrier in the 1980s, with stints at the University of Queensland Veterinary School Hospital and Pascoe’s Oakey Veterinary Hospital. He has had his own farriery business on the Sunshine Coast of Queensland since 1992. He continues to be the farrier mentor for Brian Hampson and works with Brian on equine foot research. Hampson and Wilson are joining with researchers Dr Melody de Laat and Professor Chris Pollitt to study the effectiveness of copper alloy shoes in managing bacterial and fungal insults to the foot.